A rarity for me - a card with no ink! I love the look of the Fancy Foil Designer Vellum - so I succumbed and bought some! Although, this card is really all about the flowers. I cut two frames - one in Basic Gray and one in Gold Foil, offset them a bit and stuck them together. 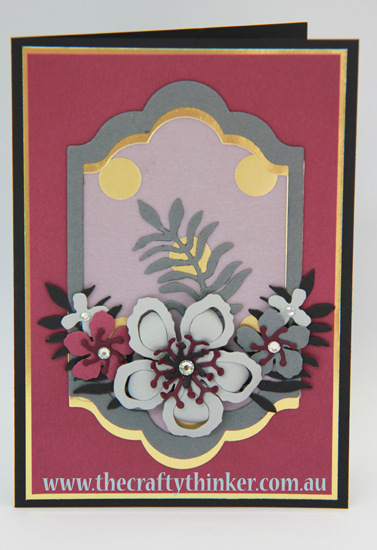 The card base is in Basic Black with layers of Gold Foil and Rich Razzleberry. The flowers and leaves are in Rich Razzleberry, Basic Black, Smoky Slate, Basic Gray and Blackberry Bliss. It's a very simple card that packs a punch - and there's no ink! To make a purchase, click on any of the product images below.